I'm not into much console game collecting. I will pick up NES and sometimes SNES games if they are cheap enough. OTTOgd wrote: Nifty game pick-ups, thanks for sharing. Thanks. I have been on a retro PC kick lately. I love them. I almost got a nice replacement Leisure suit larry 7 complete in box with guide ….. I missed out and it felt like a punch to the face.... THe search continues. I also need to replace Star wars Xwing: Imperial Pursuit. I recently got a cheap replacement for Mario is missing. I also picked these up today at value village. I used to love this golf game as a kid, and always wanted to play Mad Dog. … For 2 bucks each why not. I picked these up from a guy off Kijiji . I got them for a great price. I didnt know there were big box versions... I have the collectors set with all 3 games and am happy to have these in the collection. I love the Compucenter sticker on the box. I used to love going into Compucenter and looking at all the cool PC game boxes that I couldn't afford. Law212 wrote: I love the Compucenter sticker on the box. I used to love going into Compucenter and looking at all the cool PC game boxes that I couldn't afford. Cool finds. Post a closer pic of the sticker, please! Neat retail reference. This is not a sticker but thought it was nostalgically interesting. 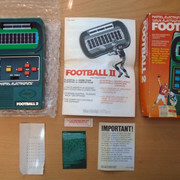 A year or so ago, I bought a Mattel Electronics Football 2 and the original receipt was still inside the box. Not easy to see but originally purchased from Eaton Centre's Leisure World for $37.32 CAD, back in '81! Great game, imho. Thats super cool! 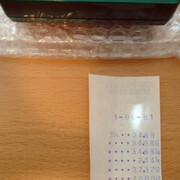 , I love when the receipt is included. I picked up an electronic chess game a while back and it looked like it was from the lte 70s or early 80s. I think it had the receipt. When I got to my moms ill take pictures. Ill take a picture of the compucenter tag a but later this weekend. I got a few more pickups this week. I always wanted to play this when it came out, but I couldn't afford it I dont think. This was a cheap ebay purchase. I have seen this reviewed somewhere and it looked neat. Value village tagged it for 9.99, but I removed the tag and they gave it to me for 1.99. I never got to play the swat games, but I loved the police quest series so I grabbed this. I was hoping id find one of these as I found the diablo chest before for 1.99. They had a tag of 12.99 on this. I replaced it with a 1.99 tag. They are really upping their pc game prices. and a couple loose genesis games that looked decent when I googled them . There was an Encarta 94 which looked complete and I now regret not getting it. ah well. ONe last pick up for the weekend. After dropping off my wife at work, I stopped into a nearby Value Village. I saw a couple copies of Amped. I see them pretty often and never picked them up even though I have wanted to play the game since it came out. Anyway Very happy to see this inside the case under the manual.